I’ve baked quite a few things from Carole Walter’s fabulous book, Great Coffee Cakes, Sticky Buns, Muffins & More: 200 Anytime Treats and Special Sweets for Morning to Midnight, but if I had to pick one favorite so far, it would be a particular dough. A dough that takes literally minutes to make. A dough that freezes exceedingly well, and can be used to make many different pastries. And a dough whose taste and texture approach or exceed that of homemade Danish pastry, with a fraction of the time and effort. Sound interesting? It’s Walter’s rich sour cream dough, or simple sweet dough, which can be used interchangeably. The difference between the two is that the former uses milk, while the latter uses sour cream. 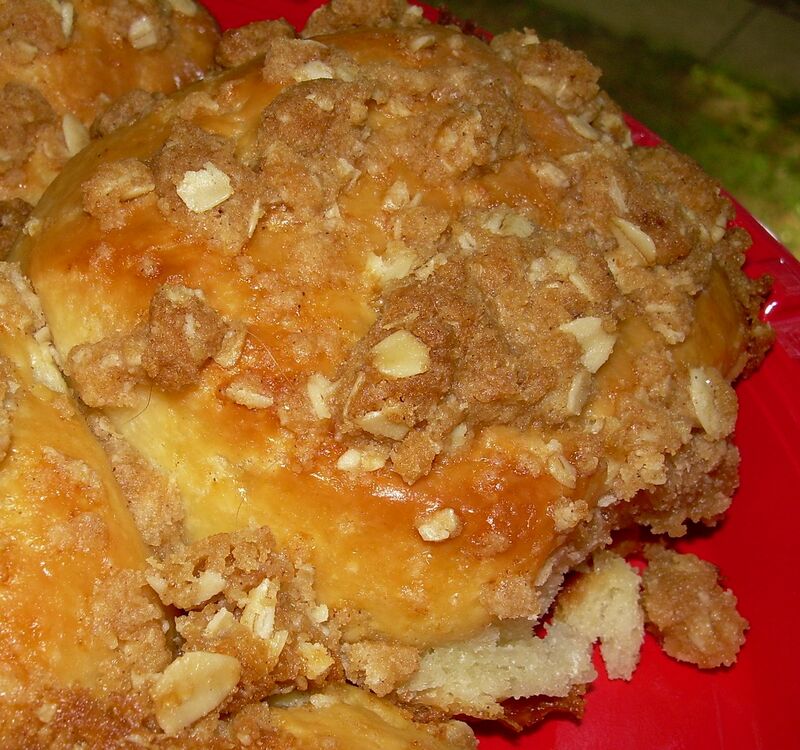 The end result is a rich, tender, flaky, and flavorful yeast bread that can be used to make braids, tea rings, buns, kuchen, sticky buns, cinnamon rolls, etc. If I have some milk or sour cream that need to be used up, I make a batch of this dough (or two), and freeze it. It is phenomenal. A few weeks ago, I made the Dimpled Sugar Cake. I suspect that dish will make rare appearances in my house, BECAUSE WE ATE THE WHOLE THING IN ONE DAY. No wonder I have to spend so much time at the gym. For a great picture of the cake, and a review of Walters’ book, check out Ivonne’s blog. Ivonne describes the Dimpled Sugar Cake as “heaven in a pan.” To be honest, I was too busy eating the buttery, brown sugary creation to try to stage a decent picture. Recently, I decided to try the crumb buns. 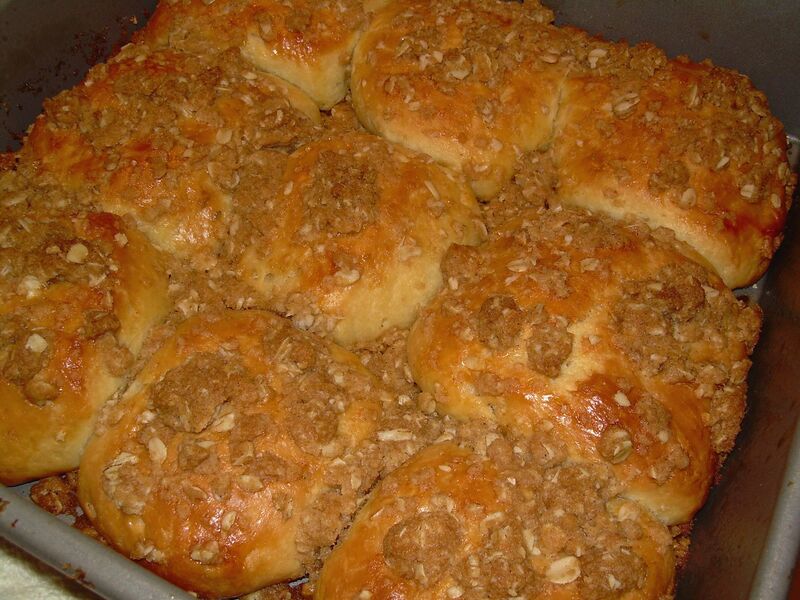 These are little pillows of warm, yeasty goodness, sprinkled with a streusel topping (I used my own recipe). I pulled the dough out of the freezer the night before, and let it thaw in the refrigerator. In the morning, I shaped the buns, let them rise for an hour, and baked them. If you wanted to, you could shape them the night before and keep them in the refrigerator overnight, ready to pop in the oven the next morning. Is that great, or what? Note: the streusel topping that I made is not terribly sweet – if you like it very sweet, add a bit of white sugar to the mix. These buns are my entry for this month’s Bread Baking Day #12, created by Zorra, and hosted by Aparna of the wonderful vegetarian blog, My Diverse Kitchen. Her choice this month was “small breads.” Be on the lookout for her roundup of everyone’s entries. And be sure to check out Susan’s weekly YeastSpotting roundup at Wild Yeast Blog. Recipe after the jump . . .
1. Add 1 Tbsp. sugar to the warm water. Sprinkle the yeast over the water. Do not stir. Cover the bowl with a saucer and let the mixture stand for about 5 minutes. Stir briefly with a fork, cover again, and let stand a few more minutes until bubbly. If there is no frothing or bubbling, your yeast may be old, and start again. 2. In the bowl of a stand mixture fitted with a paddle attachment, or in a food processor with the dough blade, mix in (low speed in the mixer, pulse in the food processor) the flour, remaining 3 Tbsp. of sugar, and the salt. Add the butter and continue to mix until small crumbs form, about 2-4 minutes, depending on the temperature of the butter. 3. In a separate bowl, whisk together the milk, egg yolks, and vanilla. Add the milk mixture to the flour, along with the dissolved yeast, and mix on low for about 15 seconds. Scrape down the sides of the bowl. Mix for another 30 seconds until a smooth dough forms. This is a soft dough. In the food processor, pulse until a ball forms, and then pulse about 4 or 5 more times. 4. Lightly butter a medium bowl. Empty the dough into the bowl, smoothing the top with floured hands. Spread a thin layer of softened butter on top. Cover tightly with plastic wrap and refrigerate overnight. You have to do this, because the dough is very rich and hard to handle unless it has had a rest in the refrigerator. 5. You can keep the dough in the refrigerator for up to three days, or wrap tightly and freeze for up to 3 months. 1 egg, beaten with 1 tsp. of water, set aside for egg wash. Put all the dry ingredients in a food processor and pulse a few times. Pour into a medium sized bowl, and add the melted butter. Mix together until you get a crumbly mass of odd-sized clumps. Butter a 9-inch square pan, or line with foil. Set aside. You can use the dough straight from the refrigerator. The recipe above is a double batch of dough, so cut it in half and store one half for another use. On a lightly floured board, pat the half that you’re using into a rectangle, and divide into nine, roughly equal-sized pieces. Roll each piece into a ball and space evenly in the pan. Cover the pan with plastic wrap and set aside to allow the rolls to rise. The rolls will NOT double, but they will swell and become puffy looking. Some, but not all, may touch each other. In a 75 to 80 F room, this will take about an hour or a little more. Rising time will vary according to the temperature in your home. Twenty minutes before you’re ready to bake, preheat the oven to 350 F. In the meantime, prepare your favorite streusel topping, or the one above. When the buns are ready to bake, gently brush them with the egg wash and sprinkle them with the streusel, very gently pressing the streusel into the buns. You do not want to deflate them. Bake them in the center rack for 30 to 35 minutes, or until they are golden brown. They are best eaten right away, but you can freeze and reheat them. What gorgeous rich buns for a special breakfast! This looks fabulous! What a great dough- I’ll have to keep this in mind because it looks so delicious! I just got this cookbook. I’m going to have to remember this one! Must try this now! I so want to get that book! Streusel topping on bread. This one is new to me. I can just imagine the combination of soft bread with a crunch. Must be good. This book is on my want list, and now I really want it! This looks delicious! It looks delicious! Great job! I also wanted to let you know I left an award for you on my blog! I love visiting your blog! This looks great, I’d love to have some for breakfast. Yum–those look terrific. I just bought this book on Monday, and I’ve been reading through it trying to decide what to make first. I completely love the idea of struesel topping on the bread!! Lovely!